Race alongside the canals hunting for Moriarty in our Sherlock Adventure, test your teams’ cerebral skills in an Enigma Challenge, or savour the delights of our chocolate making masterclass in the very home of Cadbury World! Birmingham has an enormous variety of venues spaces, making it an excellent location for one of our award-winning team building events - and a great city to explore once your event is over. As England’s second largest city adept at playing host to many major international events and exhibitions, you can be sure that Birmingham will comfortably accommodate your team building day no matter the size of your group or the theme you are working to. 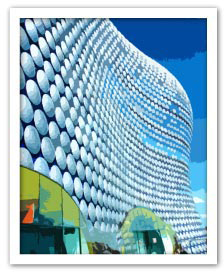 Birmingham boasts the largest jewellery quarter in Europe, a buzzing nightlife scene, award-winning restaurants and more miles of canal than Venice - not to mention all the shopping you can handle in The Bullring. If you are thinking about having your team building event in Birmingham, talk to our friendly sales team on 0845 006 06 06 about our free venue finding service. We have spent years working with the best venues all over the UK and Europe so are confident we can find the perfect place to suit your needs. Set in 14 acres of mature grounds with a peaceful lakeside setting, the Ramada Sutton Coldfield is an ideal venue for a top outdoor team build. Easily accessible, the hotel is conveniently located just 15 minutes drive from Birmingham city centre. The Jury’s Inn Birmingham offers 20 meetings rooms and 25 syndicate rooms ensuring it’s at the top of it’s game for business guests. In the heart of Birmingham city centre, the hotel is just a short walk from all the main attractions and has recently been refurbished. A beautiful 800 year old building nestled within 26 acres of elegant grounds, New Hall Hotel & Spa is widely reputed to be the oldest inhabited moated manor house in England. Sympathetically renovated, it also boasts a AA 2 Rosette restaurant.